« Excuse Me, How Do I Get to Roxham Road, QC, Canada? I thought it was a cynical joke that PM Trudeau had actually created a ministry called the “Minisitry for Irregular Immigration”. It’s actually true. It’s right there in black and white in PM Trudeau’s news release. It’s right under Bill Blair’s Cabinet position in the concluding statement. For those not up on PM Trudeau’s ridiculous, but dangerous efforts to get Canadians to speak NewSpeak, here is the background. The Liberals were furious that people used the word illegal to describe the illegal border crossers coming into Canada. So they made up a new term: “irregular border crossers”. They use the made up term “irregular border crossers” at every opportunity, and reprimand anyone who continues to use the “illegal” as promoting division. Tempting to just say “irregular” right? 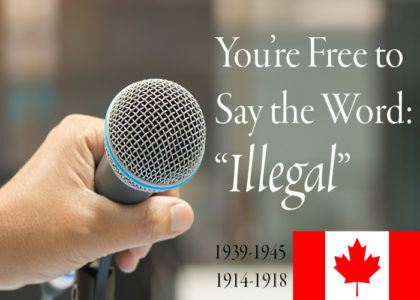 You save yourself from having to think about illegal or legal, right or wrong; and, you won’t get scolded by the Liberal word police for saying “illegal”. That’s what the Liberals are hoping you will do. Don’t. It’s not surprising that the Soros-Liberals would take a go at implementing NewSpeak in Canada. Canadians are law abiding, generous and polite to the point they dare not risk offending anyone: just the kind of people who would start using the term “irregular” with good intentions. Miriam-Webster Definition of: “Illegal: not according to or authorized by law : unlawful, illicit; also : not sanctioned by official rules (as of a game)” The RCMP advise illegal border crossers they are breaking the law, and will be arrested upon entry. The signs at Roxham Road say it is “illegal” to cross into Canada there. It is illegal. Don’t be afraid to say the word “illegal” when something is illegal. Reject the word “irregular” as “Not Canadian.” You have to give PM Trudeau an “E” for effort, but really, he needs to get back in the classroom where he can play out his Orwellian fantasy world, and some 9th graders can roll their eyes, and no one gets hurt. This entry was posted in "New Speak": Liberals Manipulating Through Language, Liberalism-Socialism-Communism, Politics, Canada, Think Over News and tagged Canadian laws, freedom of speech, Hussen, illegal border crossing, laws, MacLeod, newspeak, Not Canadian, orwell, trudeau liberals, Uncanadian.